Health today is at the heart of every area of consumption. More than ever, it is a subject that worries consumers as well as a central concern of brand and company development (incorporation of new regulations and business opportunities). It appeals to investors, who would rather wager on bio-tech companies and e-health than on energy. The health idea is undergoing a real revolution in France today. Faced with growing suspicion about the current health system (vaccine flop, medication crisis), patients are increasingly becoming experts and are more and more attuned to a global ecosystem, integrating the body, mind and soul, being inspired by American body and mind medicine and ancestral Asian practices. 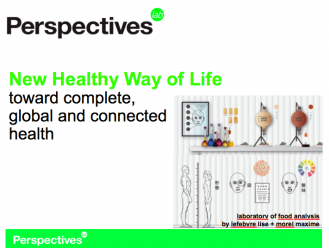 In its new prospective album, “New Healthy Way of Life”, Perspectives Lab reviews the health market segment, its emerging evolutions and its innovation potential. Contact Perspectives Lab to find out more about it and to detect the eight indispensable trends of tomorrow’s health as well as its most prospective indicators.